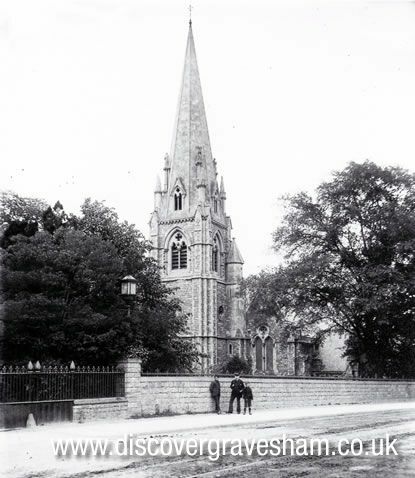 Built in 1855, St. Mark's church was designed by the architects Messrs H. and E. Rose. The cost and endowment were borne by the Rosher family. Mr. George Rosher was the patron, who also paid for St. Mark's vicarage, which stood on the corner of Burch Road until 1964. It was a charming ragstone Gothic conceit in the same style as the church. The church was built of Kentish rag and Caen stone quoins and carvings. The rag weathered very badly and extensive repairs were carried out in 1896 under W. and C.A. Bassett Smith, when the four stone angels which stood on supports round the spire were removed. The restoration of the spire was completed in 1901. St. Mark's was demolished in 1976 and replaced by the modem Church Centre.